Introducing the new 3'x5' Perma Nyl Air Force National Guard flag. Fly with pride in support of our troops! 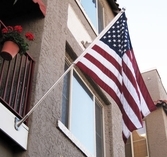 This flag is made durable with heading and grommets.